Carlos Cabeza’s scenes are mental landscapes inspired by diverse references: interior design, pop culture, architecture, geometry and the female. Cabeza’s paintings achieve clear structure even as they often emerge from ebbing and flowing lines. The artist’s purpose is the realization of rhythms in space. 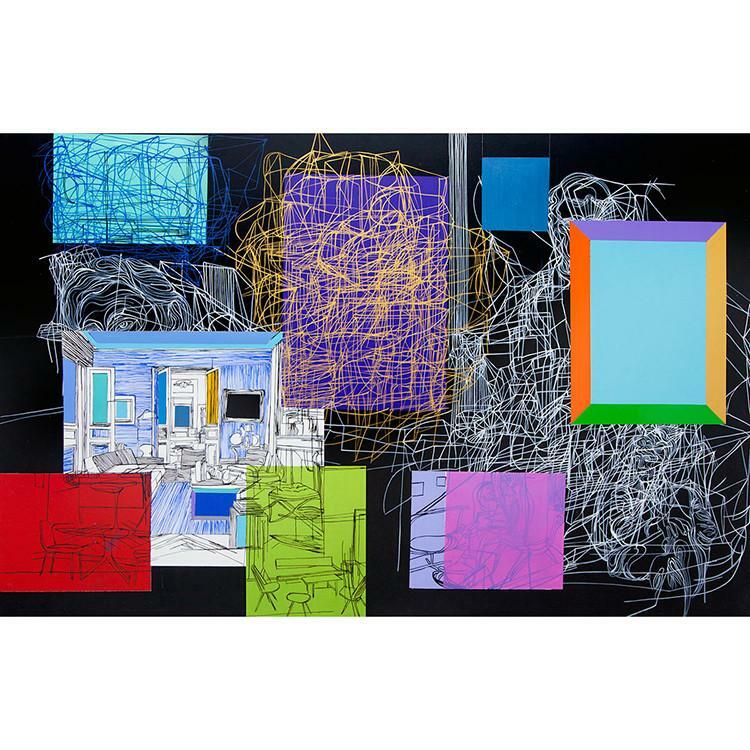 Rigid geometry and abstracted or representational forms intersperse Cabeza’s rhythms, treading boundaries between negative and positive space to establish harmony. The artist’s pictures paint fictional space. Unrecognizable, they emerge as remnants of memory. Since the earliest stages in his career, Cabeza’s painting have exhibited a bright and exuberant color palette that draws heavily in neon and flowing strokes of black. Born in Venezuela, Carlos Cabeza has lived in Paris since 1989. He studied fine arts at the School of Fine Arts of Caracas and graphic art at Atelier Santiago Pol. During this period he attended seminars on subjects that woudl be foundational to his work, particularly structuralism, which was taught by renown artist and Cabeza’s mentor, Victor Lucena. At the start of his career, Cabeza developed work in graphic and textile design. In 1985 he presented a successful and one of the first happenings in Venezuela “Fashion in Art, Art in Fashion.” The presentation is considered a seminal one with respecto to the development of the medium Venezuela. From 1981 to 1983, Cabeza worked closely with Jesús Soto, a leading exponent of kinetic art. Their collaboration deeply influenced Cabeza’s own theorization and subsequent work, even though Cabeza would take on a very different visual approach to his work. Since 1986 Cabeza has participated in exhibition and fairs worldwide. He has collaborated with eminent design and furniture firms, such as L’Éclaireur (with his work Pillows, Freud & Company) and Capellini (with Silver Honey, Cosmic Boogie Boogie and his “découpages,” called Dark Paramount Pictures). The artist has collaborated with musicians such as Aluminum Group in Chicago (with his album Happiness) and continuously with video artists in Paris, especially. Cabeza is the creator of a permanent installation for Firmenich Corporate Center in Geneva. From 2004 to 2006 he was in residence at the Cité Internationale des Arts in Paris. His most recent exhibition was with Capellini in Paris in Spring 2015, titled MetaChrome. During the last two years, Cabeza has worked in studios in Brooklyn, Paris, Caracas and Miami. 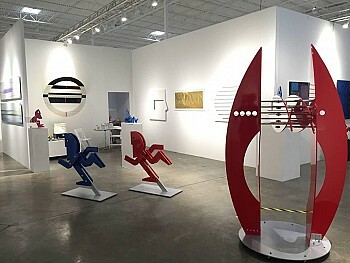 Currently Cabeza is represented in Miami, Florida by O. Ascanio Gallery. “I have followed his work for over a decade, observing unexpected artistic turns at each stage of his variations. This has led me to consider him a very serious analytical artist, calm and aware of his pictorial expression. That expression is eminently personal, unique and suggestive, imbuing his work with a special attraction.” – Alfredo Boulton (1908 – 1995), from The International Council of The Museum of Modern Art.